It is in search of bread under its first definition, a baked food made from flour, that we go as soon as we set foot on French soil. 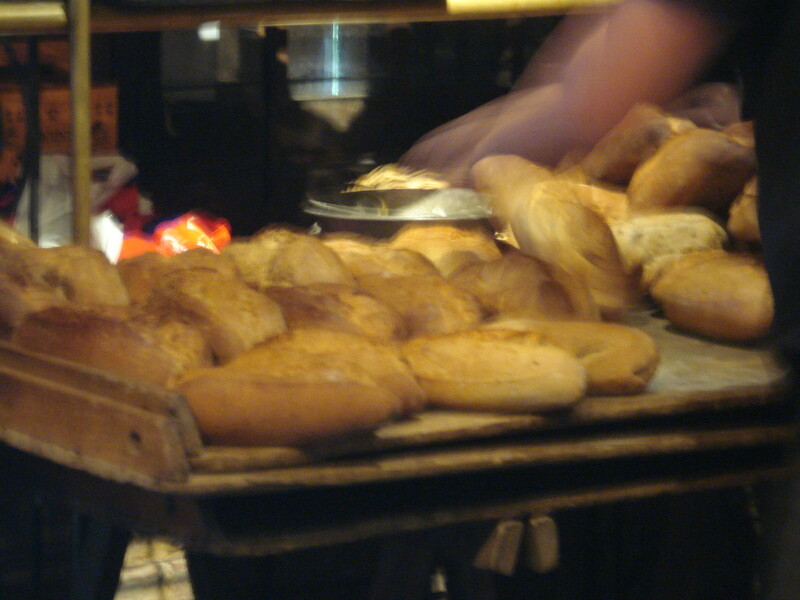 A truism, still true: bread never tastes quite like it does in France. For baguettes and croissants, an early morning run up the hill to our local artisanal bakery, Le Fournil de la Roselière in Sainte Opportune La Mare, does the trick. Although it stands alone in a quiet village, I’ve never seen it empty. Cars and trucks are constantly pulling in and owners whisking out with their daily bread in hand. 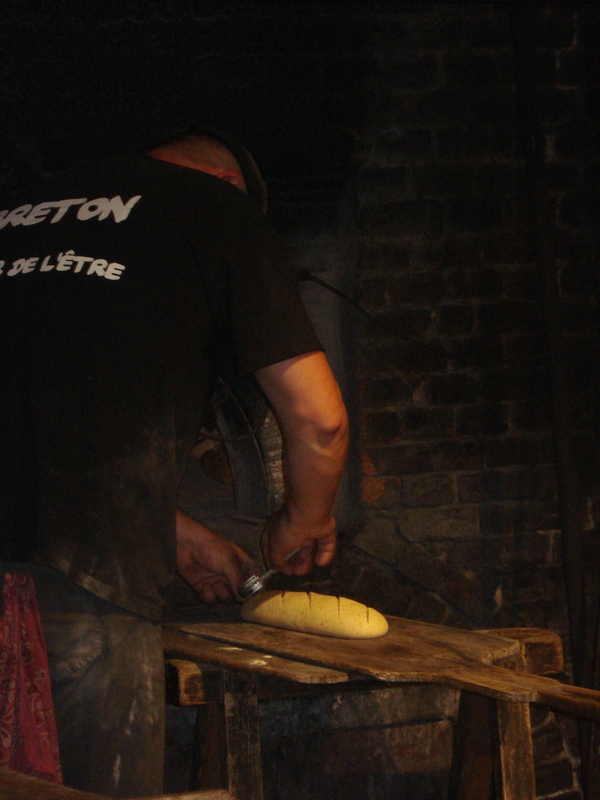 In a nearby village, La-Haye-de-Routot, is Normandy’s Bread Oven Museum. 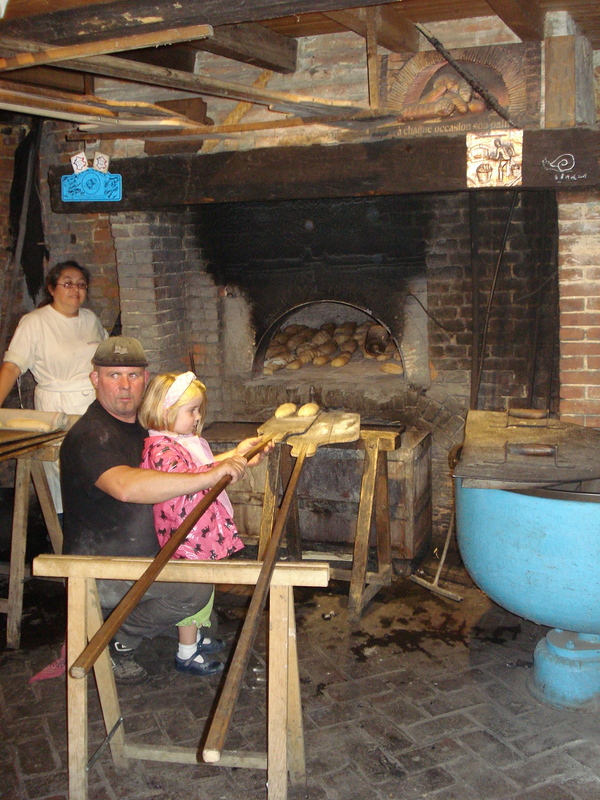 Every Sunday afternoon during the year, and every day in the summer, there are bread-making demonstrations. 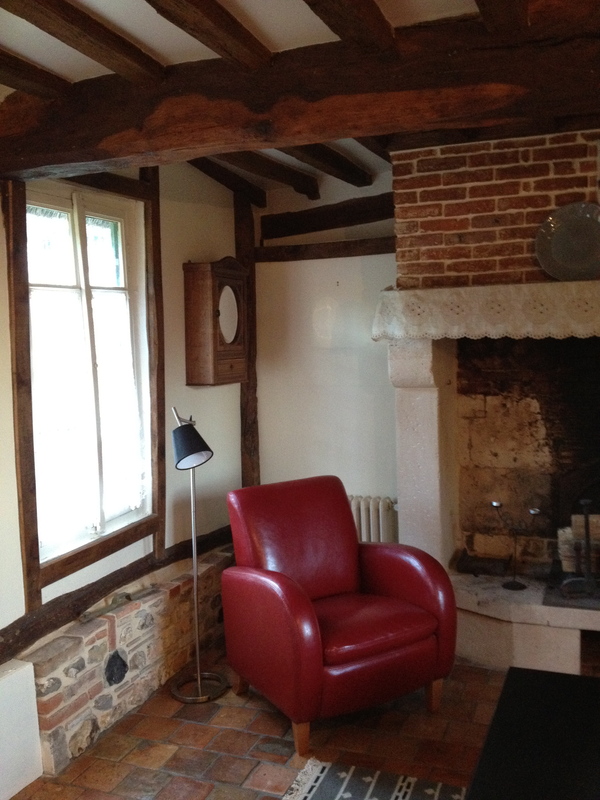 The bread oven cottage is small and dark, and the bread oven is enormous, filling half of the cottage. 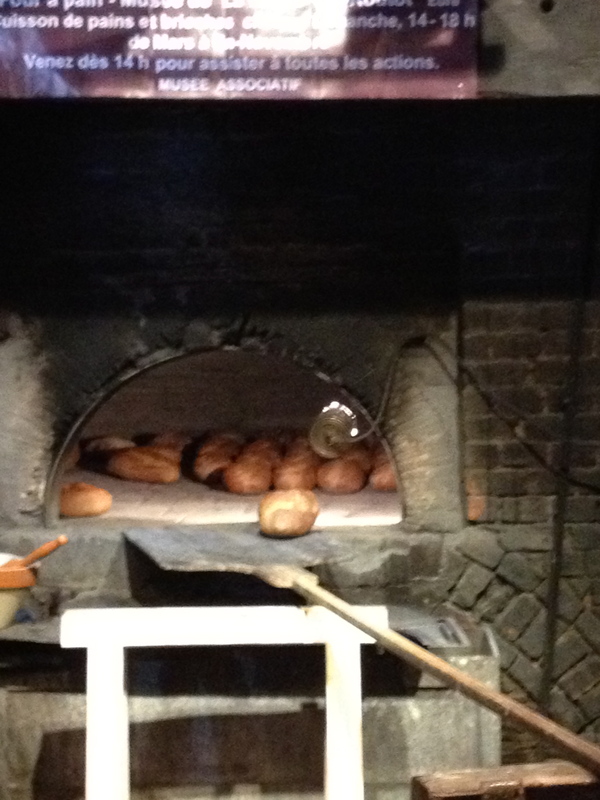 It’s the kind of oven Grimm’s witch might have tried to push Hansel and Gretel into. 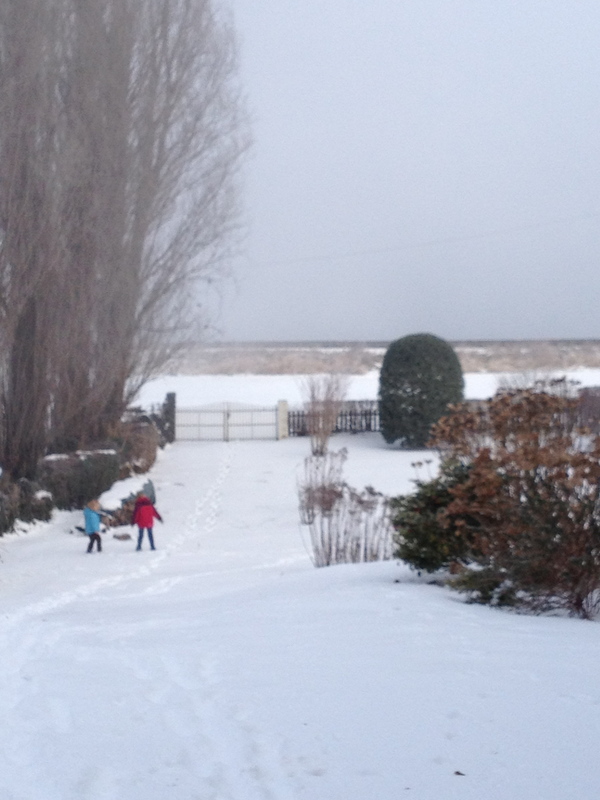 Our children are sceptical, and they keep their distance. The boulanger is large and muscular and has a booming kind of voice. 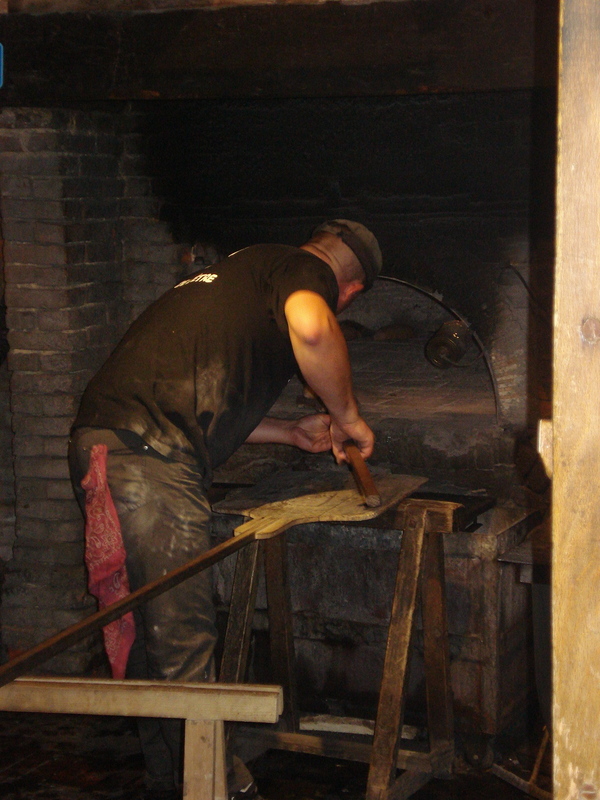 He starts us from the beginning, showing how he heats the oven and removes the coal and ash. It’s hard and hot work, requiring patience. While he works Monsieur le Boulanger keeps up a comic patter with the audience, telling jokes about the clueless Parisians who take his bread-making courses. He only bakes in the traditional way, he tells us. Baking and keeping alive the art of traditional bread making is quite literally his livelihood. He shows us how he shapes and decorates the bread, using a special tool for the detail. A pinch here, a prod there, a few seconds of extra work and people will pay three times more for a loaf, he chuckles. While the bread is baking we go for a walk and return to the smell the baking bread. Now the children are keen, gathering close to the boulanger. Each has a go at helping to remove the bread. The paddle is carefully inserted under a few loaves and then the bread is pulled out with a fast, powerful tug. Afterwards the fresh bread is sold. 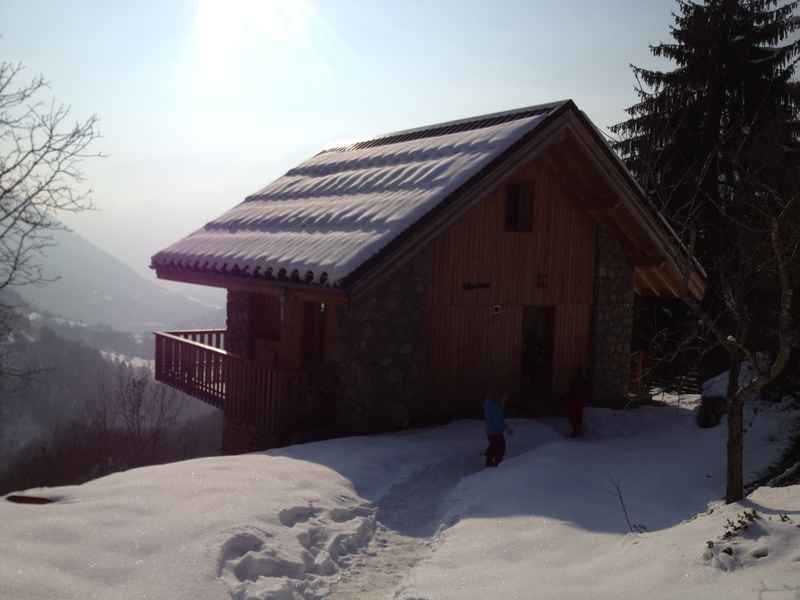 We leave with the warm loaves nestled in their white bags, ready for the evening meal. 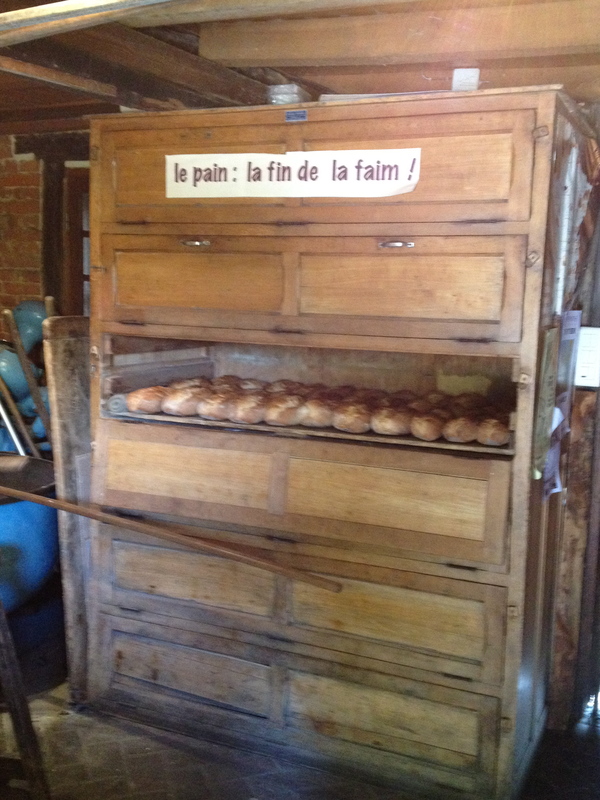 With most meals in France we eat bread, freshly made and often hot: daily sustenance. One Saturday evening there is a mass in the village chapel, to honour the feast day of the village’s patron saint, St Fiacre. 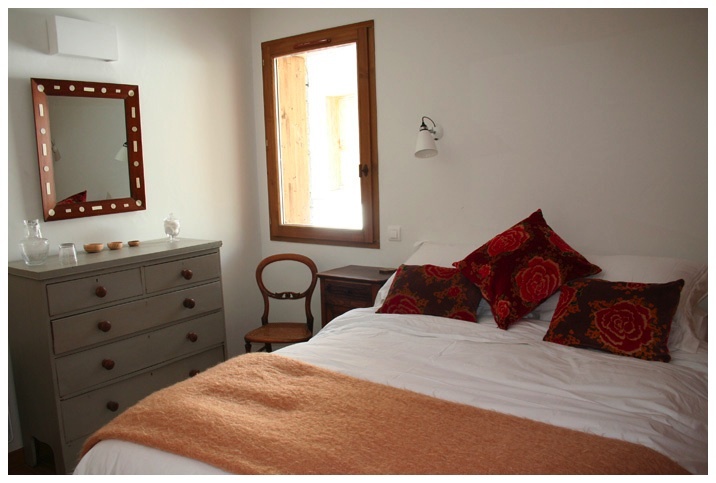 He probably started off as Fiachra, an Irishman, who travelled to France and built a hospice for travelers. Legend has it that St Fiacre furrowed a great garden with his staff. He is the patron saint of gardeners and taxi drivers. This seems fitting for our village with its beautiful cottage gardens, and I like the anomalous conflagration of rural and urban. It’s the story of our lives. We arrive at the chapel just as mass is starting and are invited to sit in the only free seats, uncomfortable and ancient wooden pews at the front. Next to us is an unexplained heap of warm brioches. Brioche is made in a similar way to bread, but is enriched with egg and butter. It was often used as blessed bread in French churches, and was sold at market in the butter centres of northern France. The mass is long and the chapel is full. We are hungry and the brioches smell so good. Finally as mass is ending, the priest and the mayor come forwards. The priest blesses the special St Fiacre brioches, sprinkling them with holy water: bread of life. The mayor invites the congregation for a glass of sparkling wine in the mairie, and the brioches are distributed. 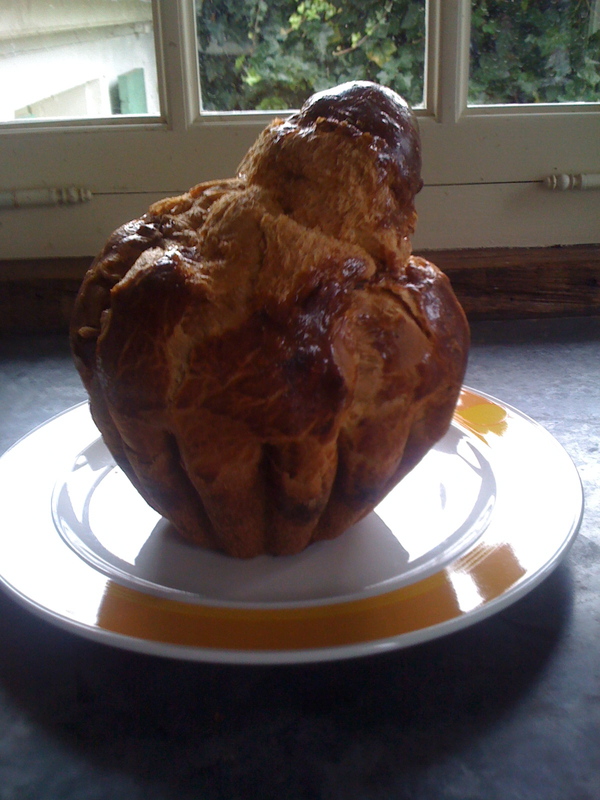 In the morning for breakfast, is the glistening golden brioche all the more delicious for having been blessed? What makes a good neighbour? In London, where we share the walls of our terraced house on both sides, and hear more intimate details of each other’s lives than anyone is ready to admit, a good neighbour allows you space. No obvious peering over fences; no comment about what may have been seen, the curtains you haven’t managed to hang after a year of living in the house, the unpruned hedge in your front garden, your children’s early morning violin practicing. A good neighbour offers to help with maintenance of shared walls and informs you of upcoming and noisy building works, but doesn’t pop round for a chat and a cup of tea unless invited properly. And then Normandy. 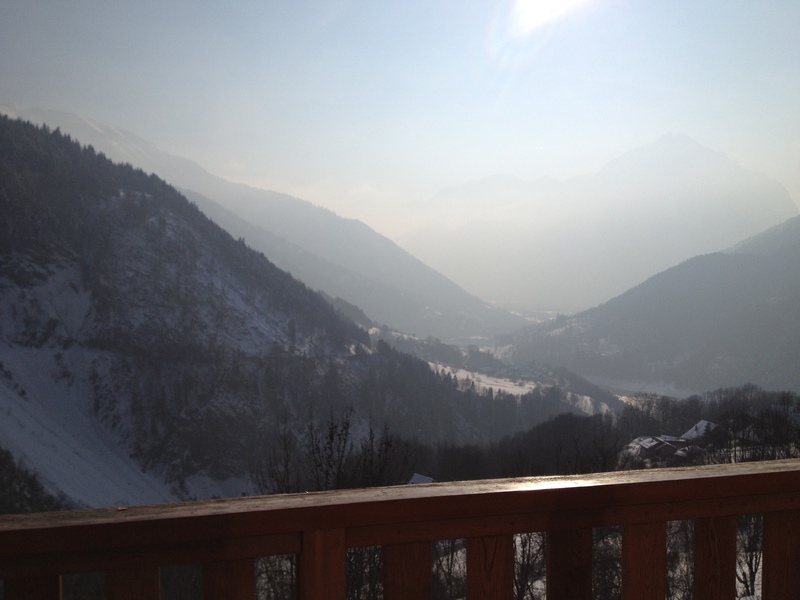 Our whole village, spread out on the hillside, has a smaller population than one half of our street in London. On the village feast day they all gather for a meal in a tent by the river, dining on ripe cheeses and homemade fruit tarts at long trestle tables. When you meet neighbours along the road you greet and chat: 5 minutes at least, but more likely 10 or 15 minutes. You will be told if your hedge is felt to need pruning. People are popping in and out all the time. It’s never, never an inconvenience. Recently our neighbours took delivery of some new furniture while we were away. 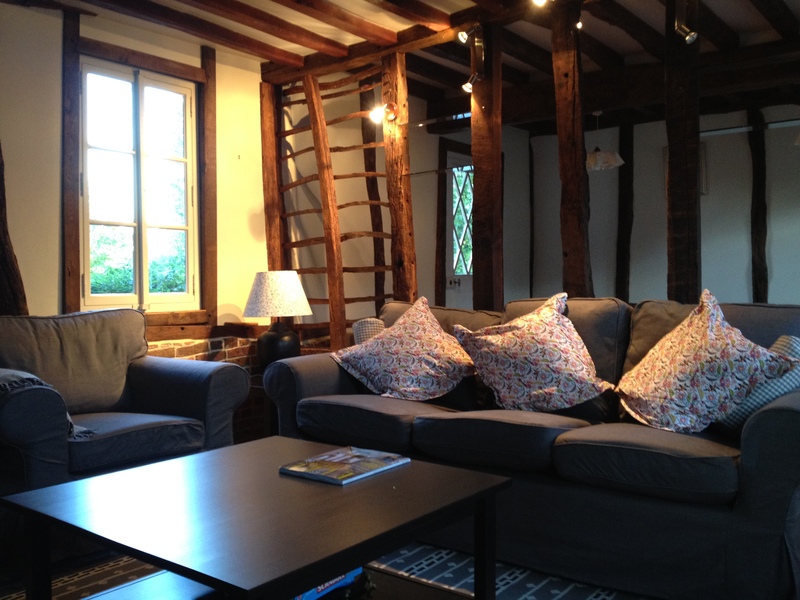 Not only did they help get the furniture into the cottage: they also assembled it and arranged the living room, a wonderful surprise when we arrived, tired and late after long days at work on an October evening. And the next morning, a knock on our door and gifts. 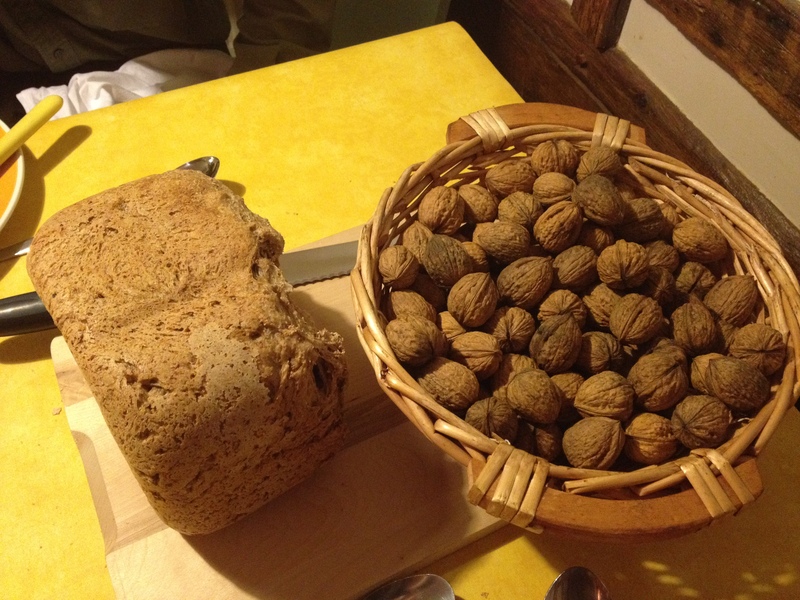 A basket of walnuts collected from their garden and, wrapped in a white linen napkin, hot and sweet from the oven, a steaming loaf of just baked walnut bread. I could get used to this kind of neighbourliness. 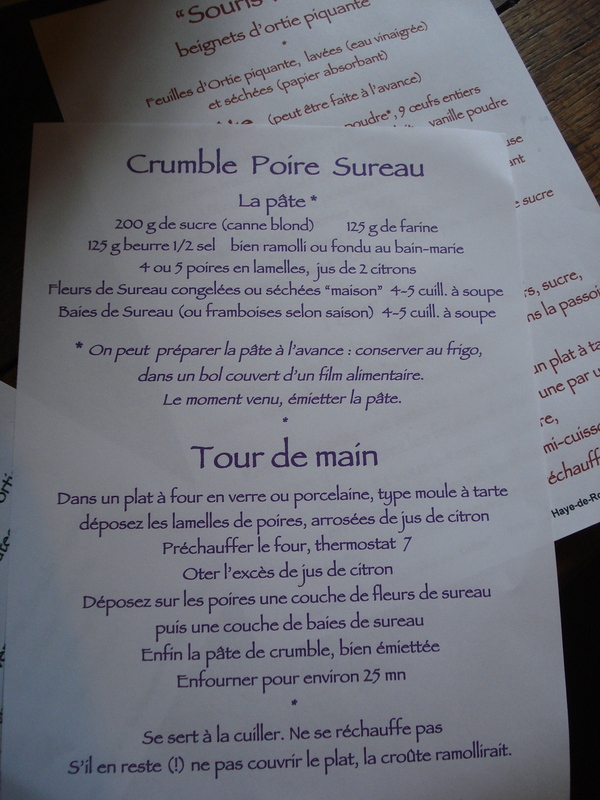 In La Haye-de-Routot, in Upper Normandy, is a collection of heritage museums exploring aspects of Norman and French culture: traditional bread making (which I have written about here), the history of clogs, the linen house, and La Chaumière aux orties, a celebration of all things nettle. 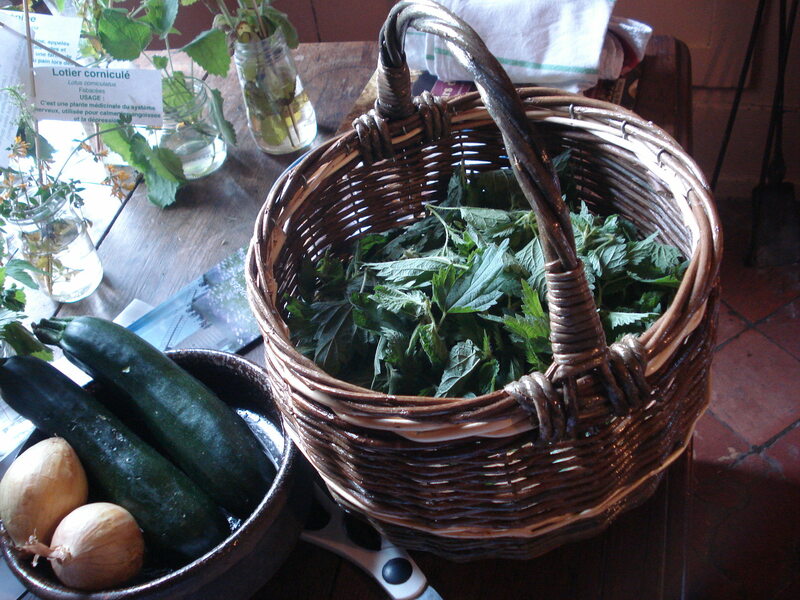 That’s right: l’ortie piquante, the common and much hated stinging nettle. I am a city girl, and nettles, like cow dung, are annoyances, to be got past quickly, ideally gotten rid of. I only remember one sort of nettle celebration in my childhood. At the boys’ boarding school my brother attended in the South Downs in the late 1970s, there was a field of nettles, thigh-high. The small boys would run through the nettles, their bare, white legs sticking out under grey flannel shorts. It was a badge of honour, to show no pain. In fact, the nettle has long been celebrated for its many good qualities: as a medicinal herb, a nutritious food, and as fibrous material used in canvas and rope. The nettle is rich in vitamins, iron and protein. It is known for its re-vitalizing qualities and is used both as a tea plant and as a vegetable. 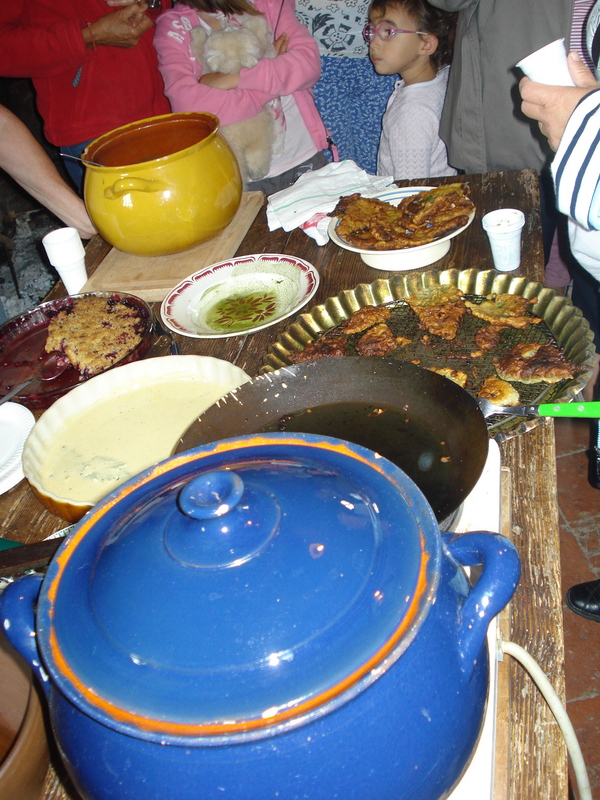 On some Sundays at La Chaumière aux orties there are cooking demonstrations. We were lucky enough to visit on a damp August afternoon. 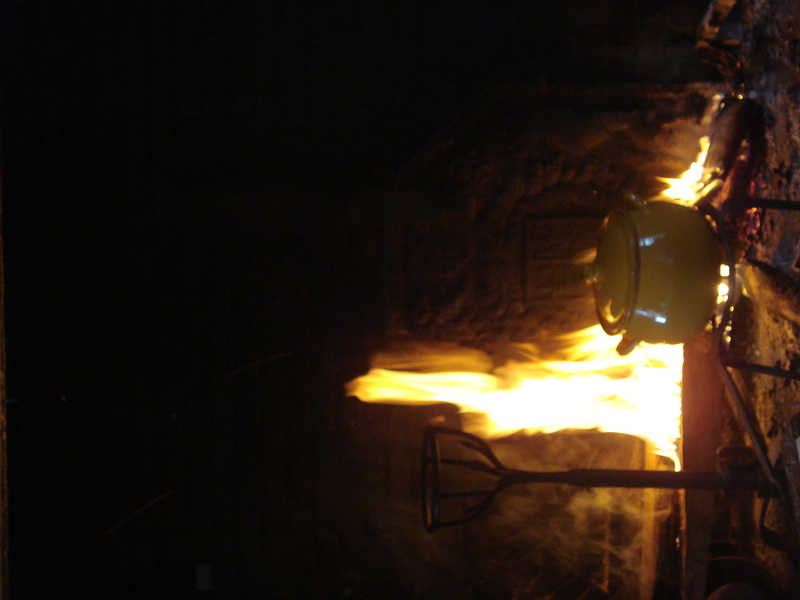 Shivering in our thin summer clothes, we were delighted to find a huge open hearth, a pot bubbling away, and a delicious smelling spread of food on a table: beignets, crumbles, cups of warm soup, a pie. A chef was giving a demonstration of open hearth cooking and handing out recipes. She invited us to taste. Of course we accepted. 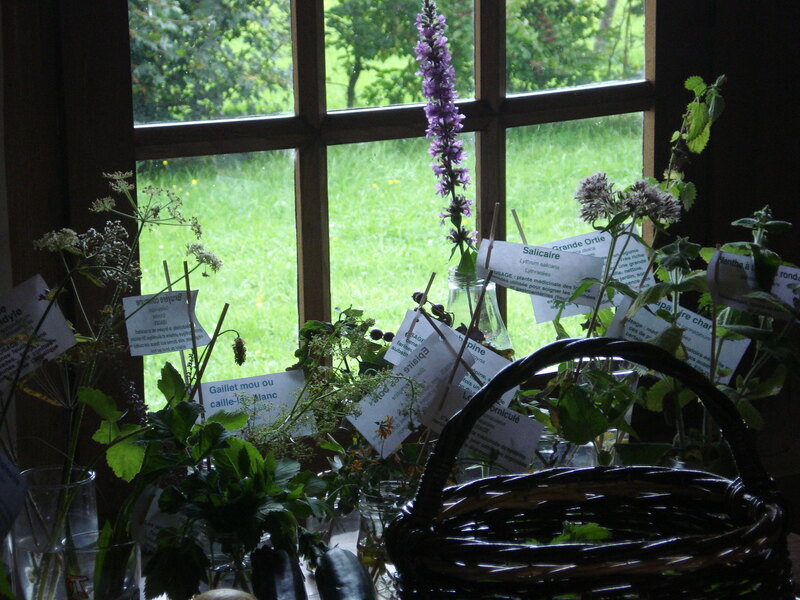 It was only as the food was going into our mouths – including the mouths of our young daughters – that I noticed the basket of nettles on the hearth, and the pictures of nettles on the wall. I asked my husband what an ortie was. Too late. And just as well, because the recipes were delicious. The soup, the beignets, the crumble and the pie: all wonderful, and not a hint of sting. Even our daughters went back for more. I took copies of the recipes with the best intentions. But I’m having a hard time reconciling the hated nettle with that delicious food. Maybe soon I’ll get over it, put on my gloves, and go nettle collecting. There’s a forest of nettles along the side of the path at the end of our garden, just waiting for me.